Is There Reason to be Concerned about Pet Foods Made in Thailand? Are Pet Foods Made in Thailand Safe? As those who deal in high-quality natural pet foods may know, a number of the respected natural cat and dog food brands are produced in Thailand. However, retailers who specialize in natural pet foods may have had to contend with one particular obstacle: consumers are leery of pet foods made in Thailand. I have encountered this repeatedly, and the Internet is teeming with such concerns. I even addressed this in one of my cat food reviews. I discussed this issue with David Forman, owner of Massachusetts-based Weruva, one of the most respected natural pet food brands on the market, which happens to be produced in Thailand. Forman and his wife, Stacie, were inspired by their three cats to come up with the idea for Weruva (which exclusively produces canned pet foods) in 2005. (They have since added a pooch to their furry brood.) 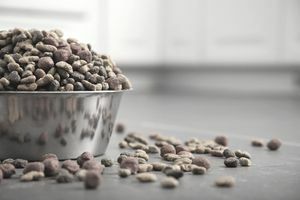 Not only did they want to include the most high-quality ingredients in the company’s pet foods, but they also wanted to produce the safest products. They found that Thailand has some of the highest standards for the production of pet and people food in the world. Weruva, which was launched in 2006, adheres to the standards set by the British Retail Consortium (BRC), considered to be one of the strictest, if not the strictest, human food processing standards on the planet. “Our factory earned an ‘A’ grading from the BRC,” Forman said. So contrary to popular belief, Thailand is home to some of the safest foods for pets, as well as people. Although he obviously couldn’t speak for the other brands, Forman said that Weruva natural pet foods (with the exception of some the brand’s dog foods, which are made in the U.S.) are made in Thailand for a unique, personal reason. “My dad is in the tuna fish business, Jana Brands, Inc., with a great supplier in Thailand. The company’s biggest item is tuna fish at the food service level. We have a relationship with the owners that go back to the ’70s. The owners of the factory were at Forman’s wedding; one was also a house guest of the Formans. Pet foods are somewhat less expensive to produce in Thailand. “The labor is cheaper, but the cost of making and running equipment is the same,” Forman said. Thailand provides a large portion of the fish consumed in the U.S.
Pet foods produced in Thailand are subject to greater scrutiny than in the U.S.
Another interesting factor is that Thailand has a government agency called the Department of Livestock Development (DLD), which is similar to the U.S. Department of Agriculture. The difference is, the DLD is stricter than the USDA because (unlike the U.S.) food exportation is very important to Thailand’s economy. So it’s within the country’s best interest to maintain the highest standards – and an overall stellar world reputation – at all times. “On top of being antibiotic-free, hormone-free and free-range, our chicken, for instance, is also DLD certified,” Forman said. One reason why consumers may be leery of pet foods produced in Thailand is because of suspicions regarding anything produced in Asia, particularly China. Indeed, pet parents became especially leery of pet foods containing ingredients produced in China following the massive 2007 pet food recalls, as the melamine-contaminated wheat gluten contained in the recalled pet foods was from China. As a result, a great many pet parents began shopping at independent pet stores that specialize in natural pet foods, specifically in search of those with ingredients exclusively from the U.S. However, after speaking with David Forman and conducting extensive research, I can attest that the majority of commercial American pet foods manufacturers can learn a heck of a lot from their counterparts in Thailand. All I can say is, ever since I began feeding my cat these foods, he has become a keen, lean, supremely healthy kitty machine!